The Lady of the Forest is the second round design release in the Amy Brown Collection. 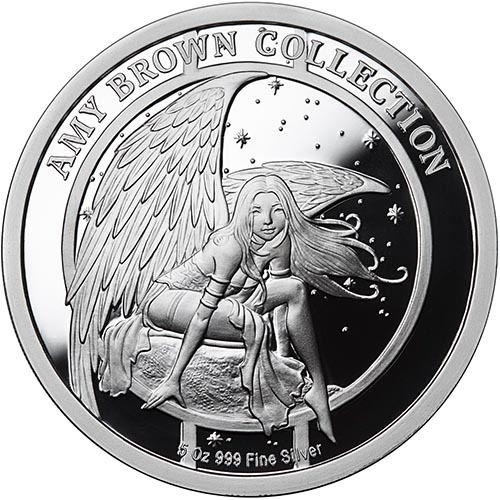 The latest in a line of stunning silver rounds for sale from the Anonymous Mint, the Amy Brown Collection catalogs some of the greatest works of the fairy artist Amy Brown on the face of silver bullion products. Today, 5 oz Proof Silver Amy Brown Collection Lady of the Forest Rounds are available to you online at Silver.com. Ships to you inside of a protective plastic capsule with Certificate of Authenticity included! Second issue in the Amy Brown Collection from the Anonymous Mint! Die sculpts from Luigi Badia. Original artwork by Amy Brown. All of the silver rounds in the Amy Brown Collection feature the best works of art in the fairy realm that she created. Born in Bellingham, Washington, Brown fell in love with the fantasy and fairy world as a young child. By 1997, she was working in a small art gallery and even contributing her own works to the collection. To date, Brown has created 2,000 different works of art in her field. She was recognized in 2017 as one of the Top 10 Fairy Artists in the world. Now, her designs come to silver rounds courtesy of Anonymous Mint. There are a total of six designs to feature in the collection, with each one released on six different versions. There are three 1 oz rounds and three 5 oz rounds per design, with proof, antique, and colorized proof rounds available. 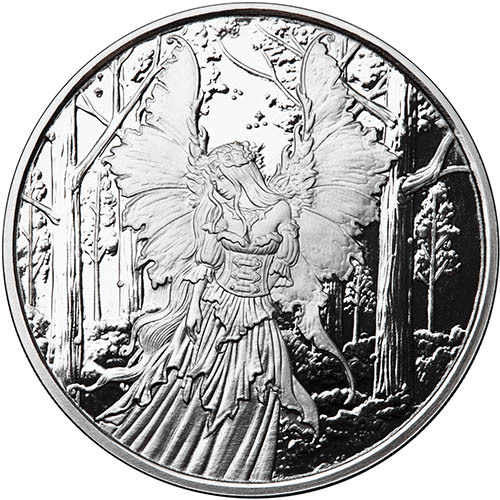 On the obverse of the 5 oz Proof Silver Amy Brown Collection Lady of the Forest Round you’ll find the design of Fae, the divine fairy of the woodland forests. Her figure is demure and calm, reminding any who look at her of the tranquil surroundings of any forest. From her branch crown to the leaf-life nature of her wings, all the features of the Lady of the Forest reflect her natural surroundings. The reverse of the Amy Brown Collection Rounds feature the image of Dusk. Created in 2003, Dusk is the fairy who watches over the realm during the hours between daylight and night. Known as twilight, Dusk watches over the transitional period from a high perch with her large, bird-like wings ready to lift her into flight. Please feel free to reach out to Silver.com with any questions. You can call us on the phone at 888-989-7223, chat with us live online, or simply send us an email with your inquiries.